Cover- Beautiful, simple, detailed! It most def sticks out on the stands because its pure white background makes both Lion-Mane and Batwing just pop right off the cover! Family- The fox family is a great contrast to life of David zavimbe which was pretty bleak. His interactions with his siblings and father are some of the best portions f this book. It also makes the finale page very chilling. Luke has allot to lose while David only had very little, Luke has to both protect his identity, family and carry out missions for batman, there is pressure at every turn. Black Hero- Luke Fox my boy you are in so far above your damn head I don’t know how you’ll ever survive this heroic career which just started I might add.We also have the rest of the fox clan: a redesigned Tam Fox, newly introduced Tiff Fox along with their parents. 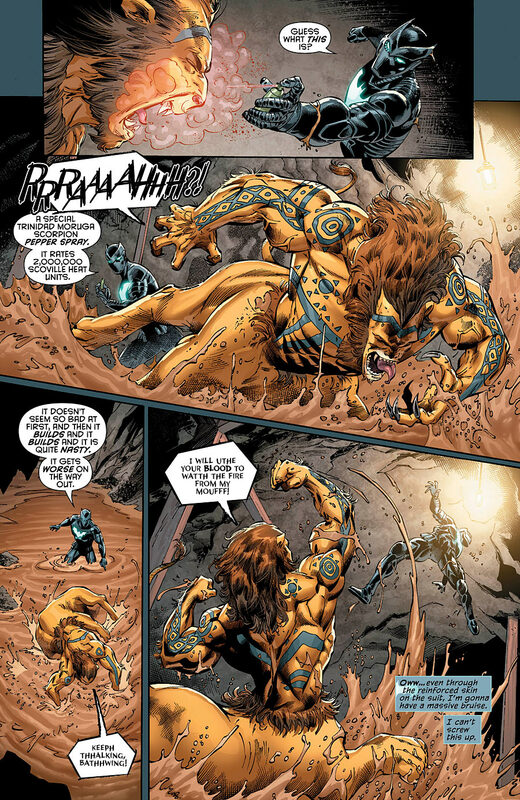 Villain- Lion Mane’s redesign is pretty impressive. Lion monster meets centaur? Yes please! He’s such a vicious, intimidating and awe-inspiring sight. I can’t help but hope that this redesign sticks because it adds quite a bit to his intimidation factor and overall appeal. Luke has his work cut out for him being in this guy’s crosshairs. Marabunta are a neat concept whose execution has been on point so far. Ants are literally all over the world and this organization is illustrated in much the same way, they are everywhere! Depending on how they are handled they could become major players in the dc universe like cobra before them. Art- everything looks pretty decent especially that epic opening action scene! Sales- As of this month Issue #19 saw an increase in readership of about 1000 + unfortunately for this book the sales figures (which can be viewed here) have already sunk below cancellation rates unless we get a good 10000 new readers to stabilize this puppy it’s gonna die. 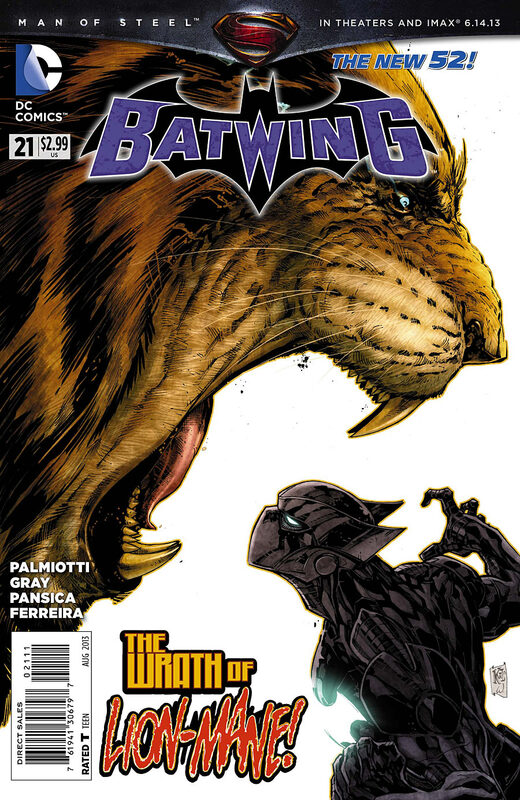 Batwing is literally the last black (book standing) ongoing from DC Comics and is very close to going the way of Mister Terrific, Static Shock and Voodoo before it. Cosby- I know some will def find some Cosby reference and joke with his family somewhere. I miss you- David Davimbe GOD HOW I MISS YOU! ← Meet the Mighty Avengers! I enjoyed the issue for the most part. Luke still looks raw, isn’t much of a strategist yet (we can see flashes but he’s usually wrong, by his own admission), and still has some growing to do. The fight is drawn well, and even made me think of Injustice a little bit (Batman’s super move finishes with his opponent being run over by the Batmobile). I like the addition of Zena, but it’ll take a while for me to warm up to her. I’d prefer a grounding presence in Luke’s life; Zena looks like another source of stress. Luke’s already something of an unrefined loose cannon. A love interest like that is gonna make his focus even worse. Case in point, he’s holding a drawing of the Batwing armor when she walks in, no doubt designing upgrades to the suit. He spends the next two and a half pages scrambling after her. And did anyone else notice that her eyes are blue? As much as I just LOVE all of these brown geniuses (genii? ), the 7-year old savant sister is a bit much. I’m gonna need Palmiotti & Gray to make her really relevant and useful, and do it in the world’s biggest hurry. Tam does a nice job of drawing the line and standing with their dad, so I’m hoping that mom is the grounding presence that Luke needs; maybe she’ll be the one person in his life who isn’t barking at him. Speaking of barking at him, I like the exchange between Luke and Lucius, but it was too short for me. I want each to see the other’s perspective, but still disagree. To me, the best part about family tension is the bond under the surface. Family can hate what you’re doing but still love you as a person; without that bond, the characters involved are just enemies. The final scene is flat-out creepy. My guess is they don’t know that Luke is Batwing; the Marabunta mention Batman, Inc and Wayne to Lion-Mane, so I think they’re going after the guy who works for Wayne, i.e. Lucius Fox. Just a thought.